Quality is important. It is hard to define but you know what it is and what it isn’t. You reject products and services that are bad quality demanding refunds, rebates, discounts and even boycotting companies. You patronize great quality telling all of your friends and coworkers about these companies. You establish customer loyalty routinely buying their products. 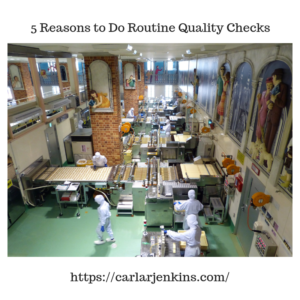 Quality is a very big deal which is why I have 5 reasons why you should do routine quality checks. To see if you’re getting the same quality levels. Reliability is important. You have to check in from time from time to see if your quality is up to snuff. Get feedback from coworkers and employees. People love giving their opinions. Why not use them to your advantage? Ask your employees what their opinions about the quality of work. Incorporate their feedback back into your work to make it better. Periodically do surveys asking your clients and customers what they think. It doesn’t have be formal. You just ask them what they think about your current customers. Take their feedback and incorporate them into your quality checklists and processes. To see if your quality standard is equal to your industry competitors. Poor quality can cost you your job if you are an employee and customers if you are a businessowner. Your quality standard has to be up to par else your clients will go somewhere else. To see if there is room for improvement. Quality is dynamic not static. You have to keep an eye out for improvement every single day. When you see an opportunity be it from customers or technology to do upgrade your quality process, do it. These 5 reasons of doing routine quality checks. Improved quality checks ensure better products and a better bottom line. Need help creating the right plan for you? Carla R Jenkins is a certified project manager, scrum master and ITIL v3 professional with over a decade’s worth of experience. She has worked in both the private and public sectors successfully completing projects and programs on time, within scope and under budget. She possesses an MBA and a BA in International Economics.